Purton Hulks Open Day. We excelled ourselves on Saturday 19th September, at the Purton Hulks Open Day. We had been invited to dowse for hulks so covered in silt and sediment, they were no longer visible - and we found not one but several. 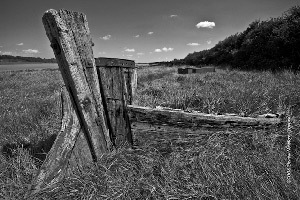 As local people are well aware, dozens of old boats have been intentionally beached along the eastern banks of the River Severn in order to prevent erosion. The idea, begun in 1909, has worked so well, many vessels have disappeared from view. Historian and enthusiast Paul Barnett, founder of Friends of Purton (www.friendsofpurton.org.uk) reports that the Purton Ships' Graveyard currently numbers some 81 vessels, but there is plenty more to discover, which is where our dowsing rods came in. There were six of us, and it was an exciting and challenging day. We were rewarded by finding several scuppered vessels, all buried but some apparently on top of each other, one in particular dowsed as having been built in the 17th century. We also found what we believed to be the prow of a ship, and wanted to know its length. Member Jon Martin, who is probably about 6ft, was particularly intrepid, and disappeared into a vast bed of reeds far taller than he was. He re-emerged, muddied but unbowed, thrilled to have found that on asking his rods for the location of rudder and stern, he had been led in a curve that coincided with the shape of the vessel. Further questions revealed that it had had three masts, was 100–115ft long, and probably had a 30–40ft long keel. Our most exciting find of the day proved to be a buried rowing boat, dowsed by our Chairman, Peter Golding. He felt it to be some 33ft long, and 9ft wide, with no engine, no mast, and seats across it. We suspected this was a cutter that had been used to ferry goods and passengers from ship to shore, built in 1789. When Paul Barnett came to see how we were getting on, he was delighted because he has records of just such a vessel but did not know where it was. 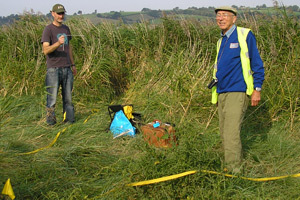 Peter Gibson, one of our most experienced archaeological dowsers, marked the outlines of the vessels with flags and yellow tape, and took GPS readings. "If it’s worth dowsing," said Peter, "it’s worth recording." We will give a plan of our findings and their locations to the Friends of Purton, and look forward to hearing how they compare with the findings of other archaeologists and 3-D radar imaging. 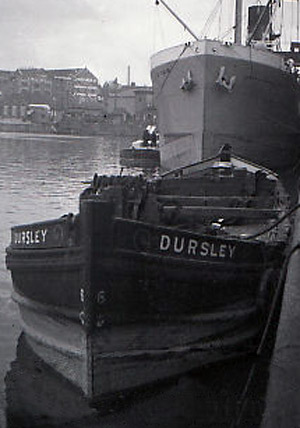 For more information on The Dursley and other vessels go to The Friends of Purton webpages.